Castine: How would the so-called Hessians stationed at Castine’s Fort George during the American Revolution have celebrated Christmas? We know from Hessian diaries dating from the period that the German troops did celebrate the holiday, and we like to think that this celebration included music. Among the 200 Ansbach-Bayreuth troops from Germany stationed at Fort George, ten were listed as Waldhorn musicians who played the natural horn. To honor these German troops at Fort George, a concert of 18th century horn music will take place at the Trinitarian Congregational Church, 69 Main St, Castine on Monday, December 3 at 3:00 p.m. The concert is free of charge, although donations will be appreciated. Following the concert there will be a reception featuring German Christmas cookies and non-alcoholic Glühwein. 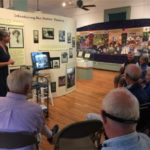 The concert is sponsored by the Friends of Castine Fortifications, the Castine Arts Association, Friends of Witherle Memorial Library and the University of Maine German Club – Der Deutsche Verein. The concert will feature musicians C. Scott Smith, Scott Burditt, John Wheeler and Ken Miller. C. Scott Smith will play the Waldhorn, or natural horn, and the other musicians will play its modern equivalent, the French horn. 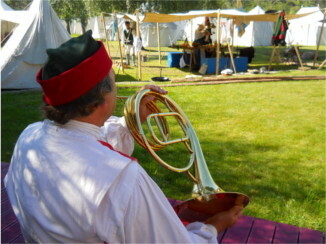 The natural horn was in use up until the early 19th century when the French horn was developed. C. Scott Smith is Associate Professor of Horn and Music Theory at Ohio University. Mr. Smith is principal horn for the Ohio Valley Symphony and the Maine State Ballet Orchestra. He is a founding member of OhioBrass and has performed throughout the United States. 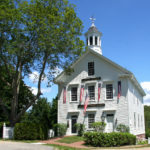 Since 1980, Mr. Smith has served on the faculty of the New England Music Camp in Sidney, Maine. Maine native Scott Burditt is a leader and mainstay of the Maine horn community. Mr. Burditt is the retired Band Director at Bangor High School and has been a public and private school music teacher for more than 35 years. He is the Principal Horn and Personnel Manager for the Bangor Symphony and is the Associate Conductor of the Bangor Band. 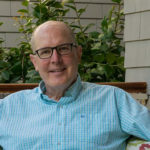 As a professional horn player, he has played with most of the performing groups in Maine, including the Portland and Bangor Symphonies, college orchestras, brass and woodwind quintets and community bands. The other two musicians of the Horn Quartet, Ken Miller and John Wheeler, are also Maine musicians playing with the Bangor Symphony Orchestra. 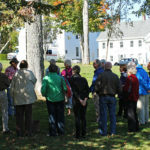 The Friends of Castine Fortifications is a coalition of Castine non-profits, the town of Castine, and interested individuals wishing to share the important history of Fort George. The Fort’s history began in 1779 when the British Royal Navy sent a detachment of troops here, intending to use the site as a base of operations against the American rebels. They built Fort George on the highest point of ground overlooking Penobscot Bay. Upon learning of the British landing, the Massachusetts legislature (this area still being a part of the Massachusetts colony) resolved to send a combined military and naval expedition to expel the British and occupy the fort.